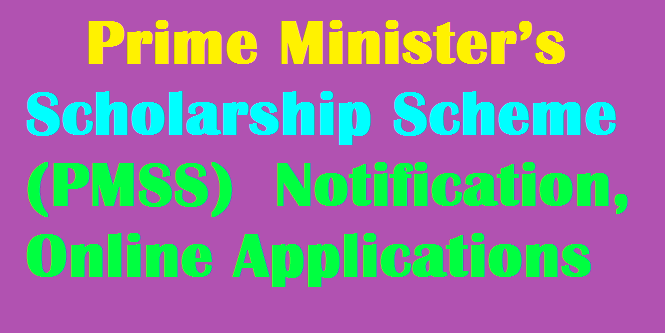 Prime Minister’s Scholarship Scheme (PMSS) 2018-19 Notification, Online Applications PMSS - Prime Minister’s Scholarship Scheme 2018-19 Notification. Prime Minister’s Scholarship Scheme 2018-19 Notification Pradhanamanthri Special Scholarship Scheme 2018/PMSS - Prime Minister’s Scholarship Scheme 2018-19 Notification:Govt Of India Ministry Of Defence Kendriya Sainik Board has given the Prime Minister's Scholarship Scheme 2018 notification and Applications are invited from the dependent wards / widows of Ex- servicemen and Ex-Indian Coast Guard personnel pursuing Professional Degree Courses, duly recognized by the respective government regulatory bodies such as MCI, AICTE and UGC etc. The scheme will be applicable only to those candidates who have joined the Professional Courses in the academic year 2018. Prime Minister’s Scholarship Scheme was introduced from the Academic year 2006-07. To encourage higher technical and professional education for the dependent wards of Ex Servicemen / Ex Coast Guard personnel and their widows (below officer rank only) and dependent wards / widows of Ex Servicemen / Ex Coast Guard personnel who died / disabled in harness due to causes attributable to Military Service / Coast Guard Service, irrespective of the rank. A total number of 4000 students will be selected Students for Prime Minister’s Scholarships are available. Govt. of India Ministry of Defence Kendriya Sainik Board ( Department of Ex-Servicemen Welfare) invites applications for the scholarship under the PMSS from the dependent wards / widows of Ex-servicemen and Ex-Indian Coast Guard personnel pursuing Professional Degree Courses, duly recognized by the respective government regulatory bodies such as MCI, AICTE and UGC etc. Only those candidates who have joined the Professional Courses in the academic year 2018-19 may apply. (a) Students who have taken admission in 2018 are only eligible to apply for PMSS 2018-2019. Students should have scored 60% and above in Minimum Educational Qualification (MEQ) i.e 10+2 / Diploma / Graduation. (b) Students who are Dependent Wards / Widows of Ex Servicemen & Ex Coast Guard personnel who died in harness / disabled due to causes attributable to military service / coast guard service, irrespective of the rank. (c) Dependent wards of Ex Servicemen / Ex Coast Guard personnel and their widows (below officer rank only). Professional Degree Courses like BE, B Tech, BDS, MBBS, B Ed, BBA, BCA, B Pharma, etc. duly recognized by the respective Government Regulatory Bodies, such as All India Council for Technical Education, Medical Council of India, UGC. (Master Degree Courses are not eligible for PMSS except MBA, MCA). Students can see the list of eligible courses for details. Students studying abroad are not eligible for this scheme. Students getting stipend for the Professional Degree Courses are also not entitled. No distance learning course is permitted under PMSS. PMSS can be availed for one course only. The facility under PMSS is restricted for Professional Degree Course only, such as B Ed but not for BA+B Ed, also for LLB not for BA+LLB. In case of integrated ME / M Tech / M Pharma initial four years scholarship will be given. Applications will be shortlisted based on Ex Servicemen / Ex Coast Guard category (as given below in Para 7) and percentage of marks obtained in MEQ. Two to five years as duration of the course approved by the concerned Regulatory Body (Except one year for B Ed). The amount of scholarship would be as follows: (a) Rs. 2000/- per month for boys (b) Rs. 2250- per month for girls Paid annually after selection.